Amazon Redshift takes automatic, incremental snapshots of your data periodically and saves them to Amazon S3. Additionally, you can take manual snapshots of your data whenever you want. This section explains how to manage your snapshots from the Amazon Redshift console. 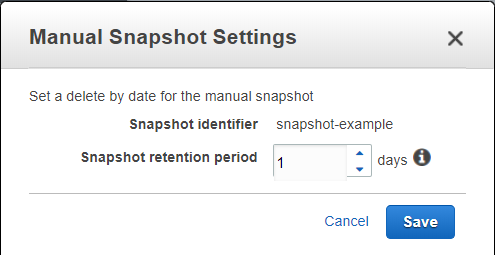 For more information about snapshots, see Amazon Redshift Snapshots. All snapshot tasks in the Amazon Redshift console start from the snapshot list. You can filter the list by using a time range, the snapshot type, and the cluster associated with the snapshot. In addition, you can sort the list by date, size, and snapshot type. When you select an existing snapshot, the snapshot details are shown inline in the list, as shown in the example following. Depending on the snapshot type that you select, you will have different options available for working with the snapshot. To precisely control when snapshots are taken, you can create a snapshot schedule and attach it to one or more clusters. You can attach a schedule when you create a cluster or by modifying the cluster. For more information, see Automated Snapshot Schedules. Under When do you want to take automated snapshots? choose Configure custom automated snapshot rules and then add one or more rules. Alternatively, choose Take a snapshot every 8 hours and specify the number of hours. Choose Select a snapshot rule to add and choose a rule template from the drop-down list. You can add multiple rules. Modify the template fields to customize your schedule. To view the schedule, choose Preview schedule for all rules. You can create a manual snapshot of a cluster from the snapshots list as follows. Or, you can take a snapshot of a cluster in the cluster configuration pane. For more information, see Taking a Snapshot of a Cluster. In the Cluster identifier box, choose the cluster that you want to take a snapshot of. In the Snapshot identifier box, type a name for the snapshot. For Snapshot retention period, enter the number of days to retain the snapshot. To retain the snapshot indefinitely, enter -1. The snapshot might take some time to complete. The new snapshot appears in the list of snapshots with its current status. The example following shows that snapshot-example is in the process of being created. You can change the retention period for a manual snapshot by modifying the snapshot settings. In the Time Range box, choose a time range that will narrow your search appropriately. In the Type box, choose manual. In the Cluster box, choose a cluster name to list snapshots for a single cluster, or choose All Clusters to list snapshots from all clusters. In the Sort by field, choose how you want the list ordered. In the snapshot list, select the snapshot that you want to modify. You can delete manual snapshots by selecting one or more snapshots in the snapshot list. In the snapshot list, select the rows that contains the snapshots that you want to delete. In the Delete Manual Snapshot dialog box, choose Continue. 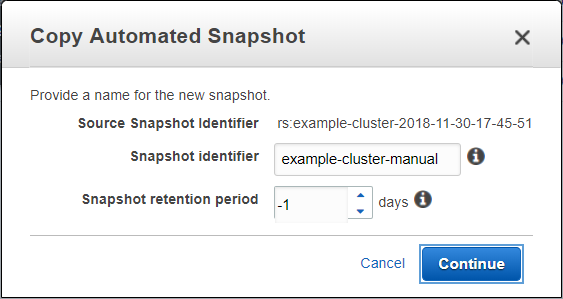 Automated snapshots are automatically deleted when their retention period expires, when you disable automated snapshots, or when you delete a cluster. If you want to keep an automated snapshot, you can copy it to a manual snapshot. In the Type box, choose automated. In the snapshot list, select the snapshot that you want to copy. In the Snapshot Identifier box of the Copy Automated Snapshot dialog box, enter a name for the snapshot copy. When you restore a cluster from a snapshot, Amazon Redshift creates a new cluster with all the snapshot data on the new cluster. You can use these steps to change a cluster platform from EC2-Classic to EC2-VPC and vice versa. In the Type box, choose manual or automated. In the snapshot list, choose the row that contains the snapshot that you want to use. In the Cluster Identifier box, type a cluster identifier for the restored cluster. They must contain from 1 to 255 alphanumeric characters or hyphens. They cannot end with a hyphen or contain two consecutive hyphens. They must be unique for all clusters within an AWS account. In the Port box, accept the port from the snapshot or change the value as appropriate. Select Allow Version Upgrade as appropriate. In Cluster Subnet Group, select the subnet group into which you want to restore the cluster. This option only appears if you restore the cluster into the EC2-VPC platform. In Publicly Accessible, select Yes if you want the cluster to have a public IP address that can be accessed over a public connection to the Internet, and select No if you want the cluster to have a private IP address that can only be accessed from within the VPC. If your AWS account allows you to create EC2-Classic clusters, the default is No. Otherwise, the default is Yes. In Choose a Public IP Address, select Yes if you want to select an elastic IP (EIP) address that you already have configured. Otherwise, select No to have Amazon Redshift create an EIP for your instance. In Elastic IP, select an EIP to use to connect to the cluster from outside of the VPC. This option only appears if you restore the cluster into the EC2-VPC platform and you select Yes in Choose a Public IP Address. In the Availability Zone box, accept the Availability Zone from the snapshot or change the value as appropriate. In Cluster Parameter Group, select a parameter group to associate with the cluster. In Cluster Security Groups or VPC Security Groups, select a security group to associate with the cluster. The types of security group that appear here depend on whether you're restoring the cluster into the EC2-VPC or EC2-Classic platform. The option to select a cluster security group or a VPC security group depends on whether you restore the cluster into the EC2-VPC platform or the EC2-Classic platform. In Maintenance track, the value of the maintenance track is displayed. In Change maintenance track to, optionally choose to restore the cluster using one of the maintenance tracks listed. 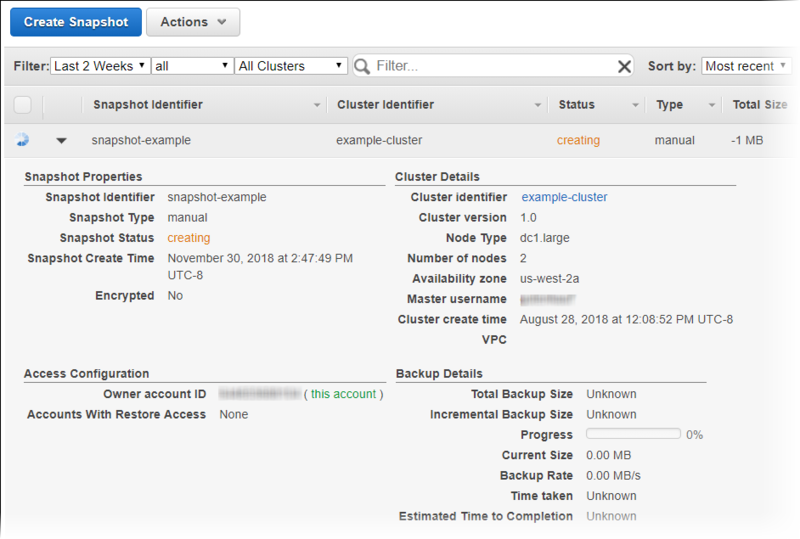 The following is an example of restoring a snapshot into a cluster that uses the EC2-VPC platform. 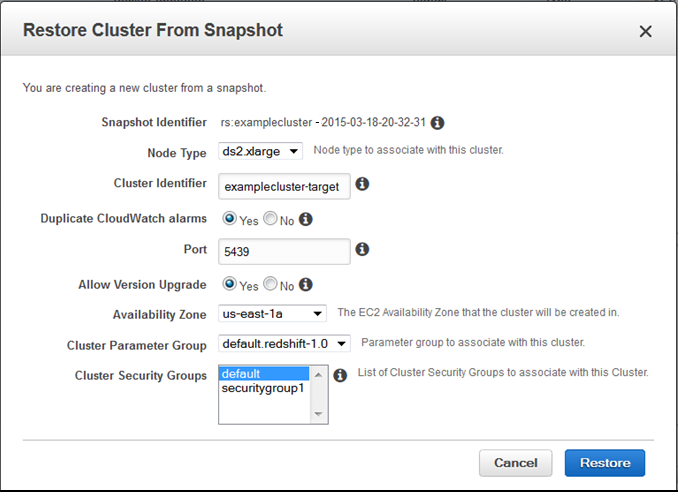 The following is an example of restoring a snapshot into a cluster that uses the EC2-Classic platform. You can authorize other users to access a manual snapshot you own, and you can later revoke that access when it is no longer required. In the Cluster box, choose the cluster whose snapshot you want to share. In the Manage Snapshot Access dialog box, you can either authorize a user to access the snapshot or revoke a previously authorized access. To authorize a user to access the snapshot, type that user's 12-digit AWS account ID in the box (omit the dashes), and then choose Add Account. To revoke the authorization for a user, choose X beside that user's AWS account ID. Choose Save to save your changes, or Cancel to roll back the changes. 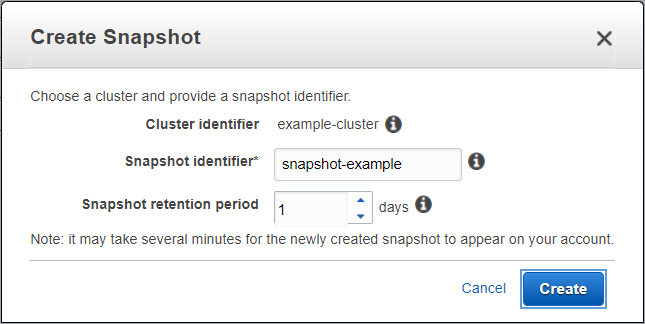 You can configure Amazon Redshift to copy snapshots for a cluster to another region. To configure cross-region snapshot copy, you need to enable this copy feature for each cluster and configure where to copy snapshots and how long to keep copied automated snapshots in the destination region. When cross-region copy is enabled for a cluster, all new manual and automatic snapshots are copied to the specified region. Copied snapshot names are prefixed with copy:. Choose Backup, and then choose Configure Cross-Region Snapshots. In the Configure Cross-Region Snapshots dialog box, for Copy Snapshots choose Yes. In Destination Region, choose the region to which to copy snapshots. In Retention Period (days), choose the number of days for which you want automated snapshots to be retained in the destination region before they are deleted. When you launch an Amazon Redshift cluster, you can choose to encrypt it with a master key from the AWS Key Management Service (AWS KMS). AWS KMS keys are specific to a region. If you want to enable cross-region snapshot copy for an AWS KMS-encrypted cluster, you must configure a snapshot copy grant for a master key in the destination region so that Amazon Redshift can perform encryption operations in the destination region. The following procedure describes the process of enabling cross-region snapshot copy for an AWS KMS-encrypted cluster. For more information about encryption in Amazon Redshift and snapshot copy grants, see Copying AWS KMS-Encrypted Snapshots to Another AWS Region. Open the Amazon Redshift console at https://console.aws.amazon.com/redshift/. In the cluster list, choose a cluster name to open the Configuration view for the cluster. Choose No to create a new snapshot copy grant. For KMS Key, choose the AWS KMS key for which to create the grant, and then type a name in Snapshot Copy Grant Name. Choose Yes to choose an existing snapshot copy grant from the destination region. Then choose a grant from Snapshot Copy Grant. After you configure cross-region snapshot copy, you might want to change the settings. You can easily change the retention period by selecting a new number of days and saving the changes. You cannot modify the destination region after cross-region snapshot copy is configured. 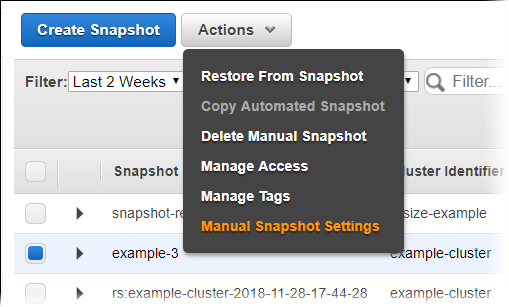 If you want to copy snapshots to a different region, you must first disable cross-region snapshot copy, and then re-enable it with a new destination region and retention period. Because any copied automated snapshots are deleted after you disable cross-region snapshot copy, you should determine if there are any that you want to keep and copy them to manual snapshots before disabling cross-region snapshot copy. 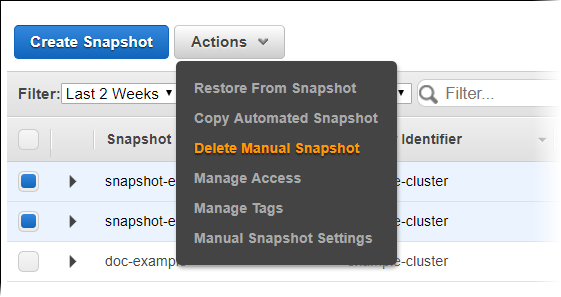 Choose Backup, and then choose Configure Cross Region Snapshots. In the Retention Period box, select the new number of days that you want automated snapshots to be retained in the destination region. If you select a smaller number of days to retain snapshots in the destination region, any automated snapshots that were taken before the new retention period will be deleted. If you select a larger number of days to retain snapshots in the destination region, the retention period for existing automated snapshots will be extended by the difference between the old value and the new value. You can disable cross-region snapshot copy for a cluster when you no longer want Amazon Redshift to copy snapshots to a destination region. Choose Backup, and then choose Configure Cross Region Snapshots to open the Configure Cross Region Snapshots dialog box. In the Enable Cross Region Snapshots box, choose No.